I wrote last month about our health system purchasing another physician group in a bid to strengthen its primary care base for Accountable Care activities. The IT team is always brought into the acquisition phase too late, which is a shame. Our ability to identify potential issues and prepare for a smooth transition is always forgotten until we’re later asked to deliver a miracle after the ink is already dry. That was the beginning of my “pastry therapy” sessions, which have progressed significantly. At the time, my biggest worry was figuring out how to get them through the EHR upgrades needed to get their first-timers ready to attest for Meaningful Use. My team was tasked with preparing for the upgrades, which is a standard duty for us. In reviewing what they had done to the EHR, I was entirely unprepared for the volume of customizations they have put in place. I was also unprepared for how ridiculous some of them are. They have a robust EHR that allows creation of custom workflows even though the out-of-the-box workflows are pretty solid. This is good for customers who have specialties the EHR doesn’t cover, but not good for customers that use the EHR as a means of managing physician behavior. Allowing for a slow retirement of their customizations would allow us to make two smaller steps rather than one giant leap, which I felt would be better for physician adoption and user acceptance. The first move would happen with their upgrade to the EHR version certified for 2014 and would involve addressing customizations that either impaired MU data-gathering (such as creating custom fields rather than using existing vendor fields that feed canned reports) or didn’t make sense (extra navigation buttons that cluttered up the screen and distracted from important clinical data.) The first step would also allow them to get used to our training style and expectations so that next time we can just use our proven franchise model with them. The second step would be the true move onto our content, although we’d keep them on their own database until the dust settled. The final step would be to perform a relatively quiet migration a few months later. Although the overall plan would take more than a year, we felt it would adequately balance the need to keep the volume of change manageable with the fact that we aren’t getting very many additional resources or dollars to pull this off. Although we’re going to assimilate their IT and training teams, we quickly discovered that they only had a rudimentary knowledge of the software since they had referred nearly all their changes out to consultants and contractors. We’ll have to retrain them not only on the product, but also add some discipline and critical thinking to the mix if they’re going to stay with us. Our meeting with the medical leadership started out well with them nodding at all the right places as we presented the high-level plan. They agreed in principle, but it started turning ugly when they began asking about which specific customizations we planned to retire in the first phase. My ever-OCD development manager quickly produced a spreadsheet. Her team had carefully catalogued every customization on a template by template basis with helpful information including why we recommend retiring it and what the proposed replacement workflow would be. They also attempted to gather information on why the changes were made in the first place, but for the vast majority, there was no compelling business case that any of the analysts could remember. I was proud of my team for pulling this together in such detail on a tight timeline, especially when they had absolutely no documentation to work from. They literally had to do a visual inspection of each part of the workflow because our new partners apparently had never heard of a build specification document, let alone an approval tracker or anything else. We began to work through the spreadsheet and were immediately stopped by our new colleagues. For every item we proposed retiring (even if it was actually contrary to the stated goals of meeting Meaningful Use, being an ACO, and providing quality care) they had an excuse why we needed to keep it. Many of the excuses took the form of, “This is something Dr. Jones really needs,” but they couldn’t provide any concrete reasons to back their statements. After a dozen or so of these exchanges, it became apparent that rather than only modifying the EHR when it was deficient, they had been using EHR design changes as a way to appease cranky providers. I’m all for modifying the EHR when it’s needed – if it’s truly deficient, if the workflow is inadequate, or if you are trying to document a specialty that’s not available from your vendor. Our group has been at this nearly a decade and all our customizations have a robust business case and have been vetted through a formal review process. We have design standards that keep pace with our vendor, so even when we customize, it appears seamless to our users. We also log every single customization with our vendor so they know there’s a deficiency, defect, or workflow need. We can’t fault them for not designing to meet our needs if we haven’t told them what our needs are. Often we find that in the process of logging an enhancement request, the vendor is already coding what we want in their next version. We can make our customization look like what they’re doing so that when we upgrade, it is truly seamless. I finished my mini-lecture on rational customization. The folks on the other side of the table just sat there with blank stares. They clearly either weren’t buying what I was selling or simply didn’t care. Pulling out my best behavioral health “motivational interviewing” skills, I tried to get them to at least acknowledge a need to change even if they didn’t like it. It became obvious that they are scared to death of having to actually deal with their peers, let alone actually manage employed physicians. Our trainers are pretty tough, but if management is not going to help us lead the physicians through a meaningful change process, we are never going to be successful. What makes me the angriest, however, is that we’ve been through this. We know what needs to be done to achieve success. We were in the same place many years ago. We have a proven track record of not only bringing practices live, but actually achieving clinical transformation and improved outcomes. We also have been able to do this without a significant change in practice revenue or any loss of clinical quality. Unfortunately, we’re now being faced with providers who have been coddled and apparently don’t know the meaning of being an employee. Rumor has it that some of them are so politically charged that they’re being paid above fair market value just to keep them from leaving. With those kinds of forces at play, the idea of achieving standardization seems impossible. If we can’t get them to agree on EHR workflows, how are we going to get them to agree on clinical content such as order sets or care protocols for chronic disease management? Looking at the impassive faces across from me, it was clear that we’re going to have to bring some bigger guns to support us. I’ve scheduled a follow-up meeting with our CIO and CFO as backup, but I’m not optimistic. There’s nothing in medical school or informatics training that prepares you for this. I’d love to be able to turn to some of my CMIO pals for advice, but the idea of admitting this level of dysfunction — even to my closest confidantes — makes me squirm. It’s good, then, that I can turn to my virtual colleagues for advice. Leave a comment if you have some words of wisdom. 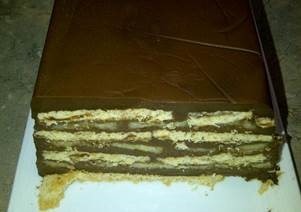 For those of you who just want some pastry therapy, that was Martha Stewart’s Chocolate, Banana, and Graham Cracker Icebox Cake. I didn’t have any milk chocolate, so I pulverized and melted several dark chocolate Easter rabbits, which was therapeutic in its own right. I also left off the whipped cream topping that Martha recommended – it was a little too over the top for my primary care brain. 1. Agree with Shane above; go after the loudest and work with them in good faith; some proportion of them will be converted over time through your collaboration, and then they can help your cause. 3. A small fraction of providers will not be pursuaded with these techniques and will then require escalation through CIO, CMO, CEO, etc. This is not easy, as you know. Cool story. Not fun but sounds like a taste of the real world. My experience has been, the biggest and hardest problem of IT is as a change agent within organizations. Everyone outside of IT underestimates this role and many easy criticisms come from not understanding the challenge this presents. The best approach is to try to win people over. Get their cooperation by any means necessary. A person who is in perpetual opposition to you will find reasons to balk. They will inflate minor concerns into major ones. They may even invent issues. Most of all your new system/business process will always be unsatisfactory to them. This does not always work. The ultimate die-hards will either have to be forced to the new way or they will leave. This is an unsatisfactory outcome for you even if you have no choice, so try to avoid this circumstance. Using the hammer causes resentment and lasting ill-will. It’s far better if they come to trust you and are willing to take certain things on faith. Therefore build up your reputation and develop trust as much as possible. One of my standing rules is: There is always one thing that the old system does better than the new system. It may be minor to you. However if you have a hold-out, they will bring up that issue over and over again. Doesn’t matter if 99.9% of the new system is clearly superior! However when you have cooperation and goodwill those matters become minor blips, as they should. Shane comment is tried and true. I have another thought that you might explore. “Compensation drives behavior.” Re engineer the MD compensation plans in a way that encourages their cooperation. Yes, Shane’s suggestion is the way to go but I give it less than 4 to 1 odds of success even pushing up the executive line for more and more clut. Why? The providers have been spoiled and the market may not work as a correcting factor. Expect blood to be spilled at some point. Can’t wait to see how this comes out. Meanwhile, I’ll take some Reddy Whip on my Ice Box cake slice, please. I’d recommend differently. Get a few easy wins in first and then tackle the tough one. The comments about working in good faith on the most vocal resistors describe what is in my view the right way to approach these things – from the high ground. One other thought: it’s important that the leadership of the acquired organization understand that losing a few people who won’t play nice is a better option than continuing the dysfunctional status quo. Sometimes the departure of a prominent and vocal obstacle is necessary and provides the kind of attitude readjustment that other resistors need. If senior management can’t even conceive of letting one of the prominent opponents leave over the end of coddling, that’s the worst. Best of luck in the long slog toward systems sanity with these new people. Have you read “Switch” by Chip and Dan Heath? Consider a visceral driver (as opposed to rational) to motivate the move away from customizations. For example, the person who physically brought a huge pile of every type of glove purchased by the organization to the meeting with leadership.